I heard a request at a meeting last night for baked rice. 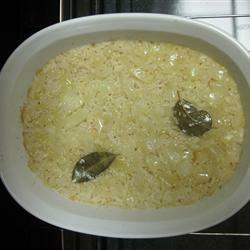 If you have been stuck in a rut with rice, try this alternative method of cooking rice. It is seriously good. and it releases the flavors in a whole new way. You might never look at rice the same way again. Heat olive oil in a saucepan over medium heat. Add carrot, celery, and onion and saute until onion is soft and translucent, about 5 minutes. Add garlic and stir 1 minute more. Increase heat to high, add chicken stock and bay leaf to saucepan and bring to a boil. Pour the mixture over the rice in the casserole dish. Cover the dish tightly with foil. Bake 20 minutes. Remove the foil an bake until most of the liquid is evaporated and absorbed, about 20 minutes more. Remove and discard the bay leaf. Season with freshly ground black pepper, fluff with a fork, and serve. 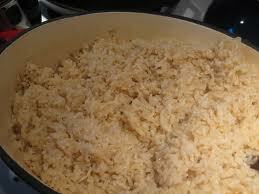 Note: If you like drier rice, return to the oven an additional 5 to 10 minutes, to your taste. Bring chicken broth, olive oil, salt, powder, onion, and cayenne pepper to a boil in the same saucepan; pour over the rice and stir to combine. Cover and bake for 1 hour and 15 minutes. Posted on February 1, 2013, in Herbs and Spices, Recommendations, Side Dishes. Bookmark the permalink. Leave a comment.